New York • The events and the arguing and the booing that would make this a U.S. Open final unlike any other began when Serena Williams’ coach made what she insisted was an innocent thumbs-up, but the chair umpire interpreted as a helpful signal. 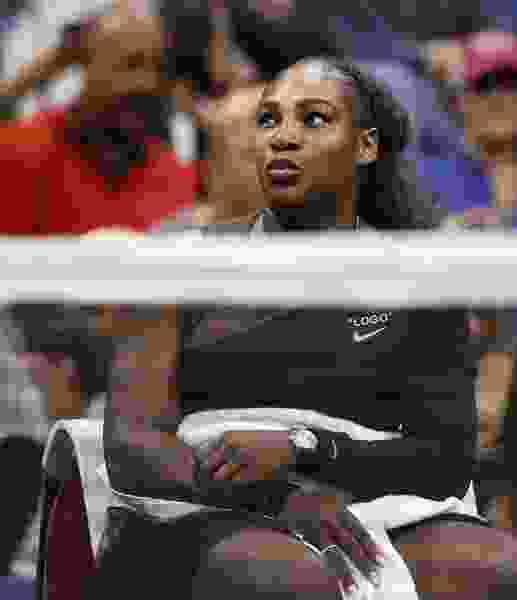 It was the second game of the second set Saturday, in a packed Arthur Ashe Stadium, and Williams’ bid for a record-tying 24th Grand Slam title already was in real trouble because she was being outplayed by first-time major finalist Naomi Osaka. Chair umpire Carlos Ramos warned Williams for getting coaching during a match, which isn’t allowed. She briefly disputed that ruling, saying cheating “is the one thing I’ve never done, ever.” A few games later, Williams received another warning, this time for smashing her racket, and that second violation cost her a point, drawing more arguing. Eventually, Willams called Ramos “a thief,” drawing a third violation — and costing her a game. Soon, Osaka was finishing off a 6-2, 6-4 victory that made her the first player from Japan to win a Grand Slam singles title. That is not, however, what will be remembered about this match. With jeers bouncing off the arena’s closed roof, both players — the champion, Osaka, and the runner-up, Williams — wiped away tears during a trophy ceremony that was awkward for everyone involved. Williams whispered something to Osaka and wrapped an arm around her shoulders. This was the only the latest in a series of high-profile conflicts with match officials for Williams at Flushing Meadows. It all dates back to 2004, when an incorrect call during a quarterfinal loss to Jennifer Capriati was cited as the main reason for the introduction of replay technology in tennis. Then came Williams’ infamous tirade after a foot fault in the 2009 semifinals against Kim Clijsters, and a to-do over a hindrance call in the 2011 final against Sam Stosur. “It’s always something,” Williams said. Osaka is just 20, 16 years younger than Williams — and grew up idolizing the American, even asking her to pose for a selfie together at a tournament just a handful of years ago. Their age difference was the second-widest gap between women’s finalists at a Slam in the professional era. What was most problematic for Williams on the scoreboard was that she was unable to keep up with a version of herself. Osaka, who happens to be coached by Williams’ former hitting partner, hit more aces, 6-3. Osaka hit the match’s fastest serve, 119 mph. She had fewer errors, 21-14. She saved five of six break points. And she covered the court better than Williams did. Indeed, that was what might have been most impressive. Osaka never let Williams’ back-and-forth with Ramos distract her, never wavered from playing terrific tennis. The one time Osaka did get broken, to trail 3-1 in the second set, she broke back immediately, prompting Williams to smash her racket. That cost her a point, because of the earlier warning for coaching. Williams’ coach, Patrick Mouratoglou, acknowledged afterward that he did try to signal Williams, but didn’t think she had seen him — and added that he thinks every player gets coaching during matches. It was the second Grand Slam final defeat in a row for Williams, after Wimbledon in July. She’s appeared in only seven tournaments this season since returning to the tour after having a baby during last year’s U.S. Open. Williams asked what she’ll tell her daughter, Olympia, about what happened Saturday.